Now in its 13th edition, this year’s Istanbul Biennial, which runs through Oct. 20, is called “Mom, Am I a Barbarian?” taking its title from a book by the Turkish poet Lale Muldur. It fills five venues in Istanbul’s bustling downtown, bringing together 88 artists from around the world: 15 of them are Turkish, others are from Latin America, the Middle East, Europe, Asia and North Africa. Back in January, Fulya Erdemci, the curator of this year’s Istanbul Biennial, decided to focus the exhibition on art in public spaces. The city was booming, but at what cost, and for whose benefit? It had become the central question there. Ms. Erdemci wanted artists to engage with the issue, and citizens to engage with public art. This staircase has been repainted in colorful stripes after people were upset when the city covered the unapproved colors in dull gray. During the winter, organizers of the Biennial, which opens to the public on Saturday, began applying for permits to install works around the city and in buildings slated for demolition. Then in May, Gezi Park, a once-dingy area near the city’s central Taksim Square, erupted, as Turks of all backgrounds took to the streets in a wide-ranging protest set off by anger at how the government was developing the city without the consent or participation of residents. Riots broke out, police tear gas flowed and the Biennial was forced to move inside. Last week, as visitors arrived, the largest demonstrations since June erupted in Istanbul. More demonstrations are planned for this weekend and the crisis in Syria has led to an influx of refugees to Turkey and has put the government even more on edge. Given the volatile climate, the city did not grant the art fair permission to show works in public areas, out of fear of protests. This decision meant that many artists had to rethink their contributions or produce works that commented on the dynamics of public space, rather than actually use public space. Instead, the brothers’ installation, “Intensive Care,” features a small dark room in which lights play against a tiny scale model of the building. After spending a month last winter in the city, Erik Rietveld said he could sense the tension building. “There was a frustration, people were so worried about the possibilities of exposing themselves,” he said. Perhaps the most telling Biennial exhibition space is a nearly unmarked storefront in a shopping mall, tucked between shops with mannequins in head scarves and long, polyester robes. 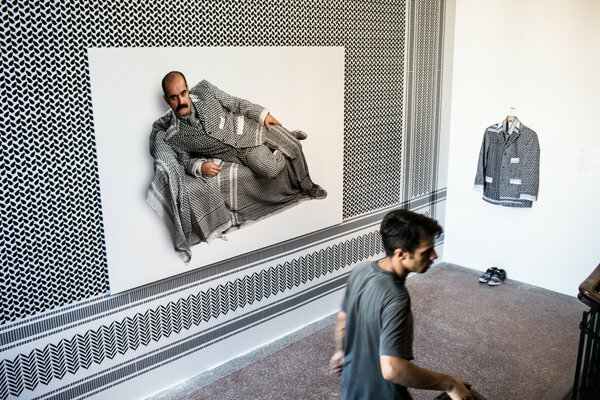 It’s indicative of the somewhat marginal role of contemporary art and of the largely secular intelligentsia in Turkey, where the Islamic party of Prime Minister Recep Tayyip Erdogan dominates the economy and the debate. In Gezi Park, the city has embarked on a politically charged, if quaint, landscaping project, planting beds of roses and marigolds and turning on a once-dormant fountain. Indeed, in an atmosphere in which seemingly mundane acts like standing in one place or silently reading books in the park became forms of resistance and led to arrests, some spontaneous public art in Istanbul has resonated even more powerfully than the art on view in the Biennial. A few weeks ago, a retired engineer caused a stir when he painted one of Istanbul’s many steep flights of stairs in rainbow colors. Visitors flocked to the stairs and newlyweds posed for photos there. But the painting wasn’t approved, and the municipality repainted the stairs gray. Protests ensued. People started painting stairs across Turkey. To calm the waters, the city repainted the original staircase in colorful stripes. “Wonderland,” an arresting video filmed in February by the Turkish artist Halil Altindere that is showing at the fair, features a group of boys of Roma descent from the Istanbul neighborhood of Sulukule. They perform a hip-hop song and dance about the fate of their neighborhood, where old houses were bulldozed to make way for the new, and ethnic populations were transferred to new housing in high rises on the outskirts of the metropolis of nearly 14 million. SALT, Istanbul’s premier contemporary art institution, is also hosting parts of the Biennial, as well as a retrospective of the pre-eminent Turkish artist Gulsun Karamustafa, whose work addresses questions of migration, displacement and the Turkish military dictatorship of the 1970s, during which time she was imprisoned. He checked Twitter on his laptop to see if any demonstrations were planned for that night. “It was a very good wake-up call,” he added. This entry was posted in Artistic Protests, News and tagged Ataturk Cultural center, Gezi protests, Istanbul Biennial, Taksim Square on 13 September 2013 .